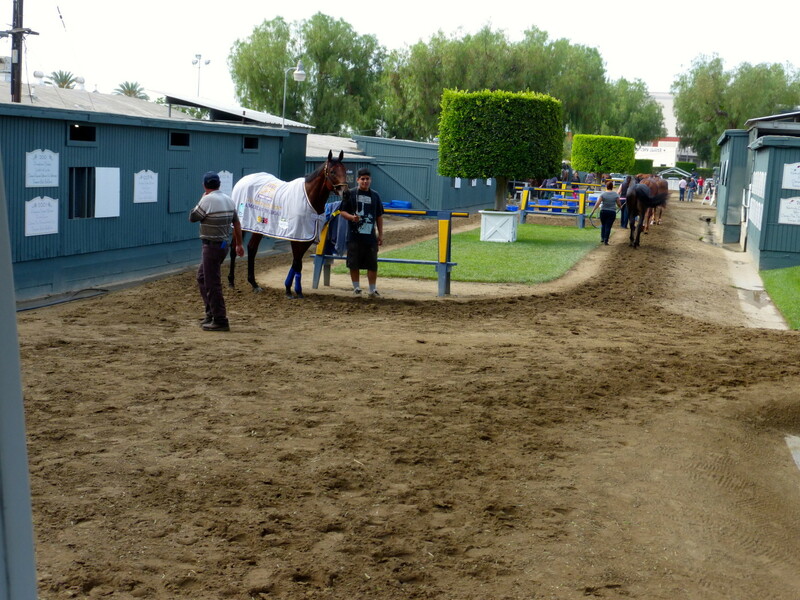 It’s not often (if ever) you get to see a Triple Crown winner up close (especially since there is only one horse currently alive who has accomplished that feat), but Tracy and I hoped we would get lucky when we called last week and scored tickets to an early morning tour at Santa Anita Park in Arcadia on closing day of the meeting: Sunday, June 28. 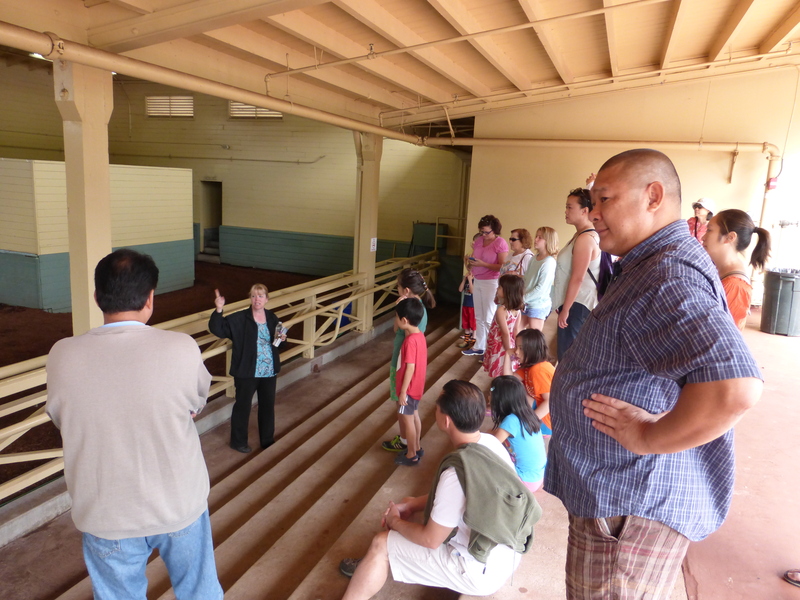 Although it’s called “The Seabiscuit Tour,” we were betting that another horse would be the star of our day. 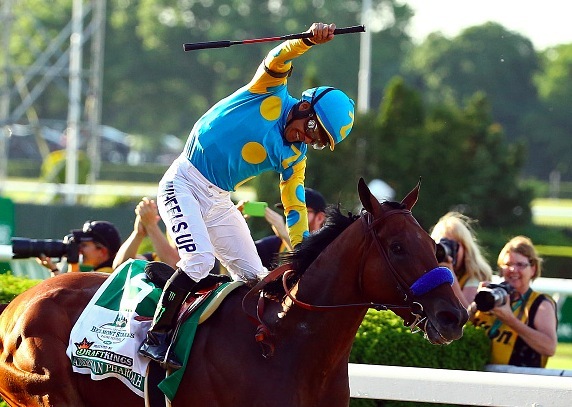 Like many of my bets (although not the one below), it would be a longshot at best to see him up close (thanks to my friend Lenny and his friend Linda, I am now the proud owner of that Triple-Crown clinching ticket). 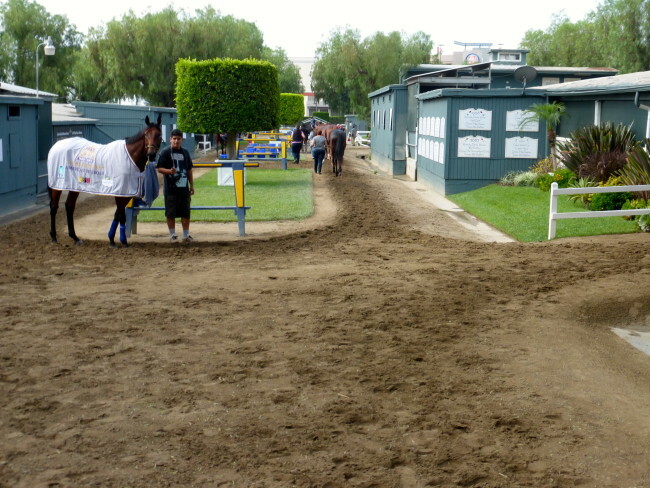 Just the day before, on Saturday, the 2015 Triple Crown champion American Pharoah had been paraded in front of 21,000+ racing fans at Santa Anita, and we surmised he might still might be hanging out somewhere on the premises the next morning. We thought it was worth a try. Plus the tour was free (that’s right, you don’t have to pony up any cash). 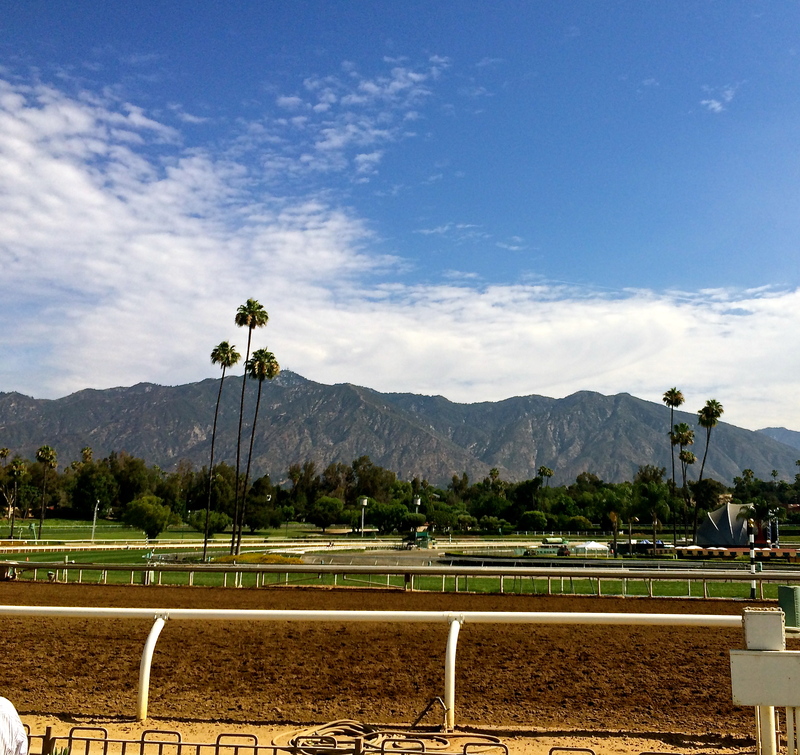 With the San Gabriel Mountain range offering a beautiful backdrop, Santa Anita (nicknamed “The Great Race Place”) is one of the most famous and beautiful race tracks in the United States (or the world for that matter). 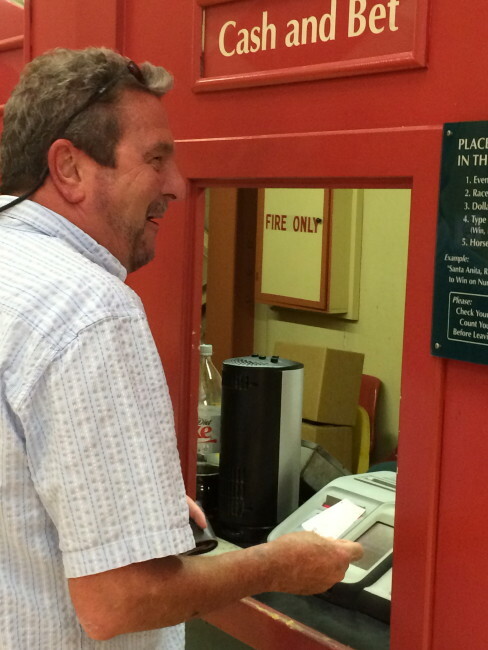 I’ve been coming here since I was a kid (yes, gambling builds character for a youngster). 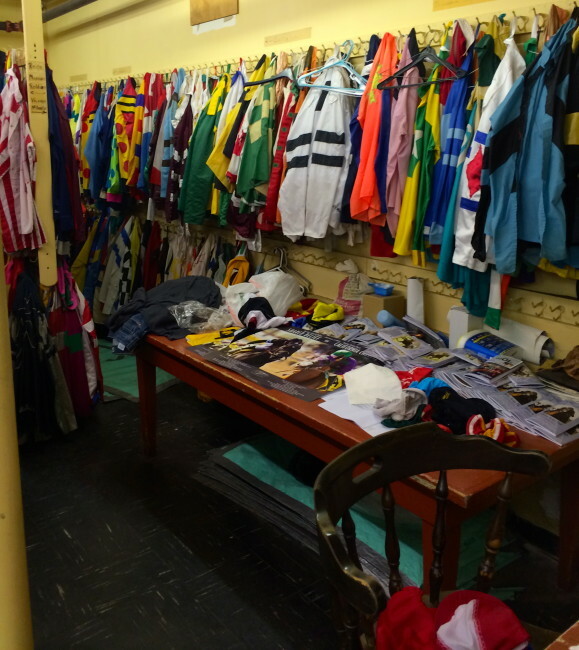 I can also honestly say that I have taken much more of their money than vice-versa (more on that later) in the course (whether dirt or grass) of my lifetime. 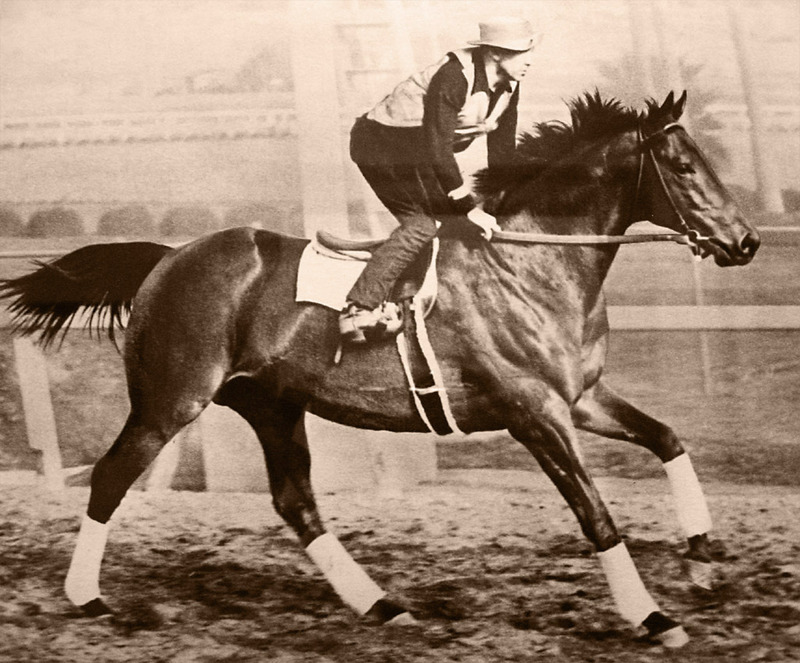 The first Santa Anita Handicap was run in 1935, and many of America’s greatest horses have run here over the years including Seabiscuit (above…ridden here in a workout by George Woolf…more on him later), triple-crown winner Affirmed, Spectacular Bid, the great John Henry, and the incredible filly, Zenyatta. Tracy, our friend Susan and I arrived at the track at 8:15 for our 8:30 a.m. tour. 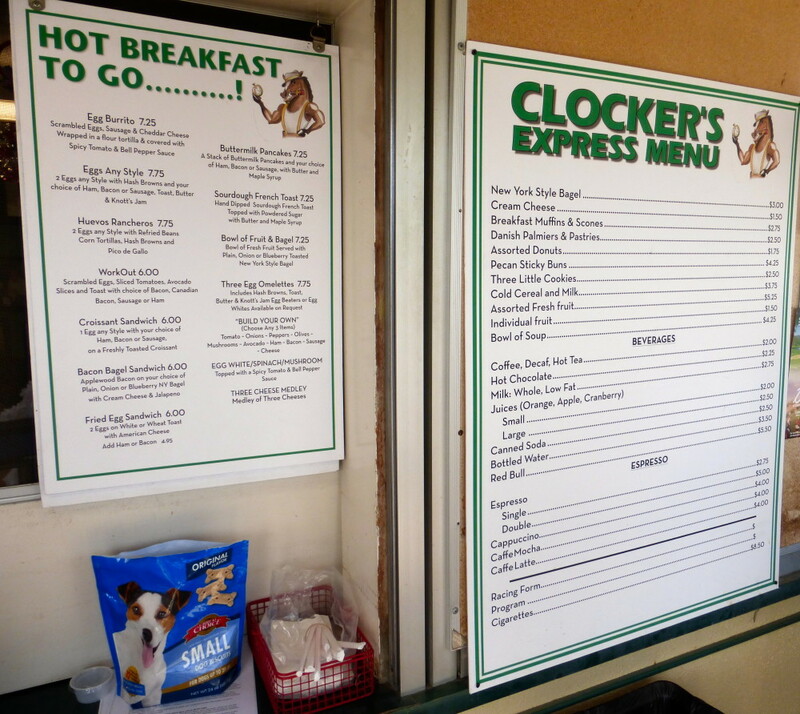 We hung out at Clocker’s Corner, the outdoor restaurant located on the far turn. When I looked closer, I saw the back of a man’s head with white hair. That hair could have belonged to only one person, and I was right. 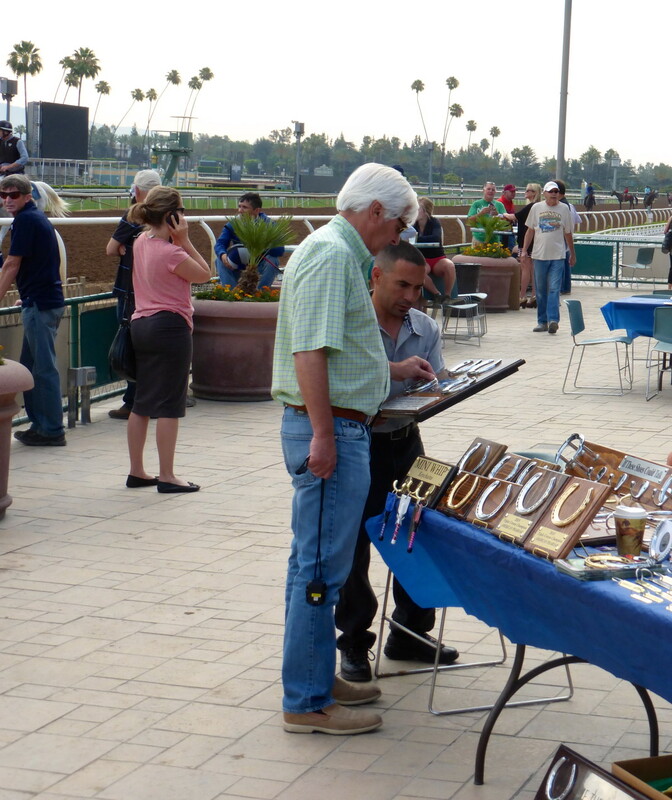 It was Bob Baffert, trainer of American Pharoah. After he chatted with some folks, I walked up and told him how impressed I was with American Pharoah, and how we had watched the race from the airport in Miami in between flights from Madrid back to Los Angeles. He was enthralled with my story (ok, he said thanks and moved on). 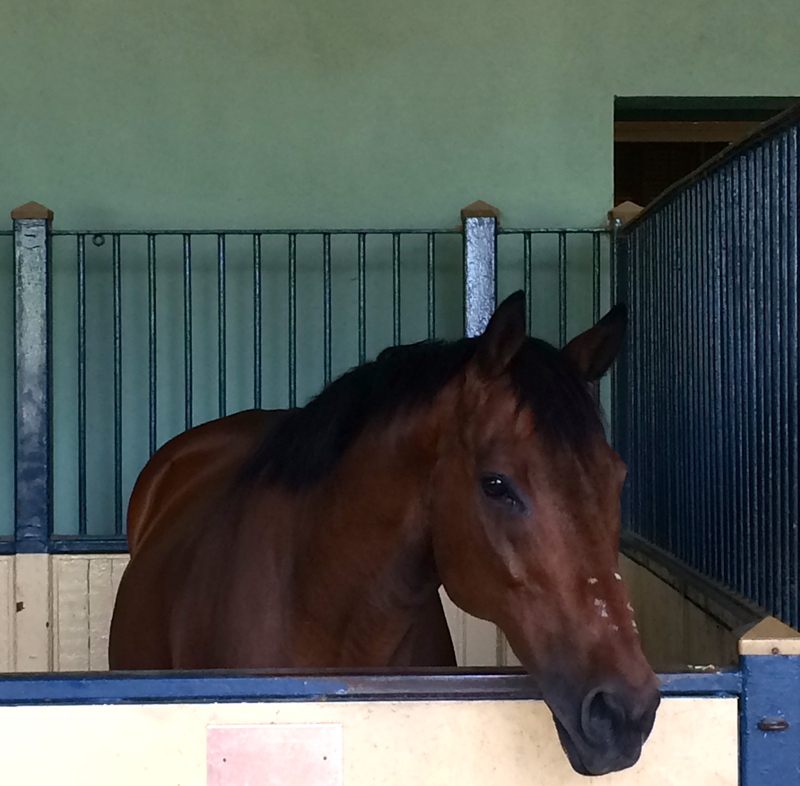 Anyway, it was kind of cool to say hello to him, if only for a moment. 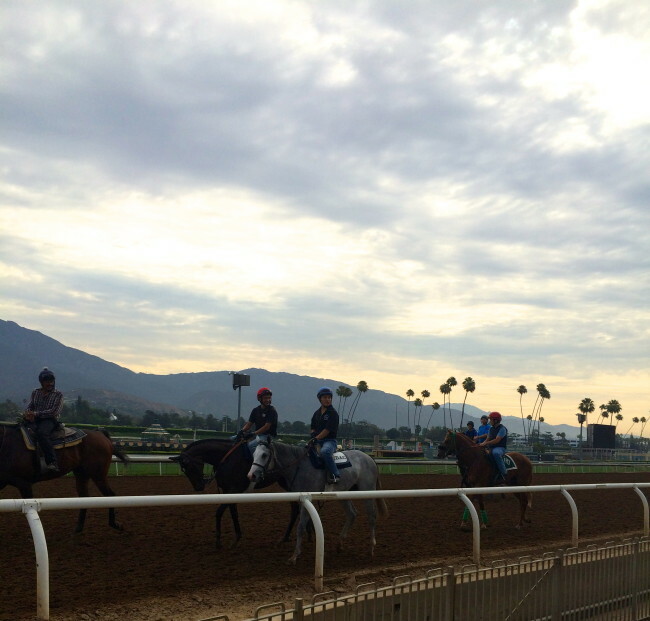 We watched a little of the morning workouts before the tour started. We had been told American Pharoah had already been on the track. That’ll teach us to sleep in. 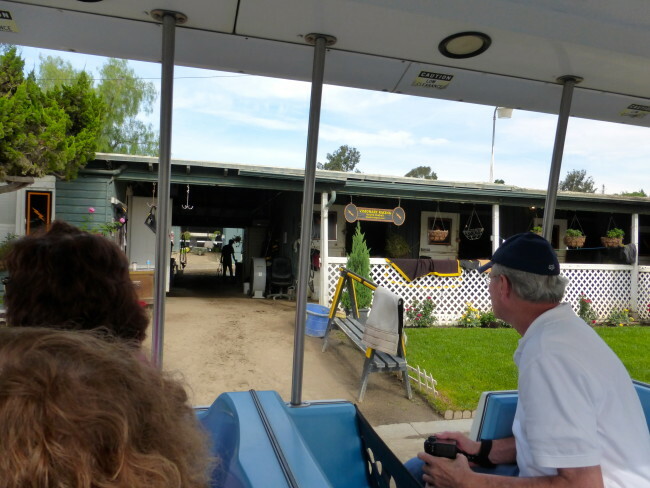 It was then time to get on the tram, so we hoofed it over to the vehicle that would take us to a very stable environment, the place where the horses reside before and after the races. 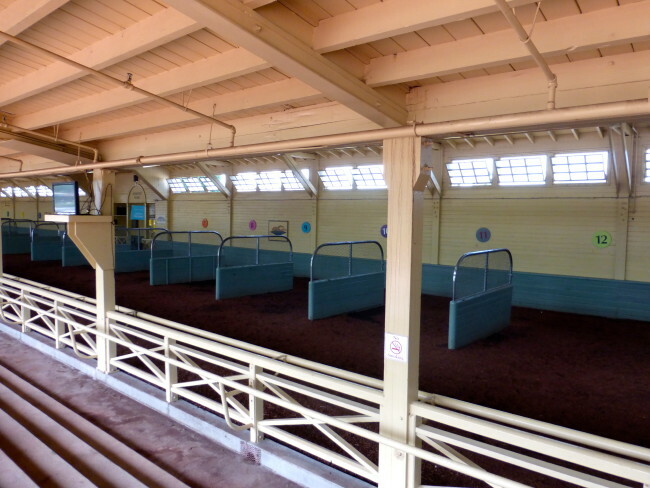 We asked if we were going to be able to see American Pharoah, and the tour guide said we would see his barn, but that we would not be able to see him. Disappointed, we hopped on the tram and off we went. The tram meandered through the stable area past Seabiscuit’s old barn (went by so fast on the tram, we didn’t even get a photo), and we heard about what goes on back in this area. Horses were being walked and we saw some of the famed stables. 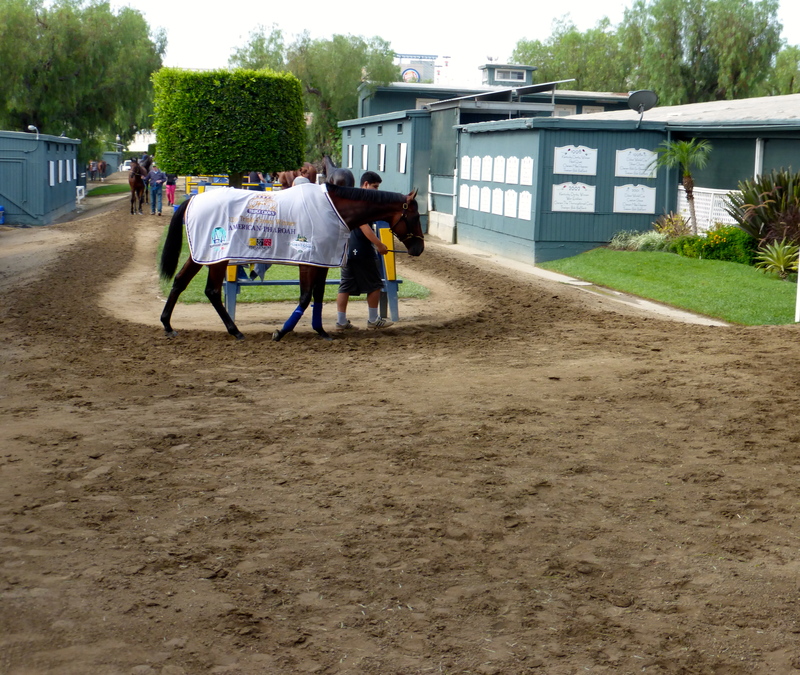 Sure enough a few seconds later, here comes Pharoah draped in a blanket that stated he was the Triple Crown winner (flaunt it baby, flaunt it!). 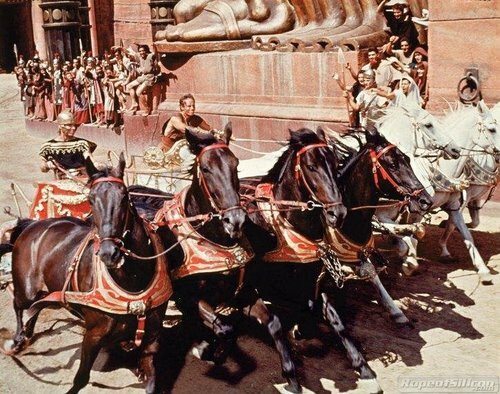 Knowing he was on stage, the horse turned toward the tram and posed like a movie star on the red carpet at the Academy Awards. 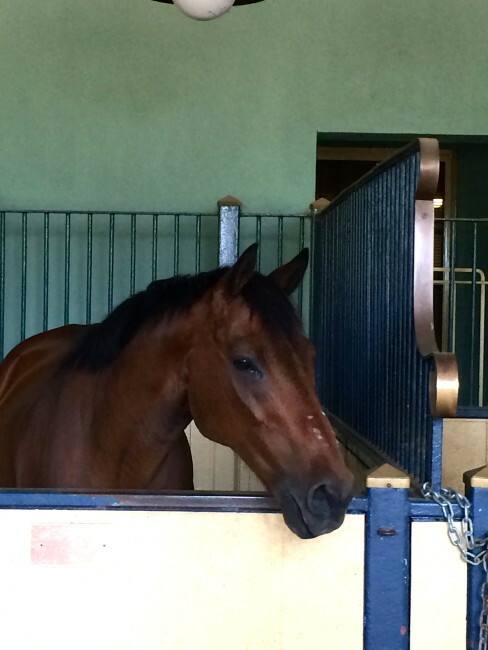 I think he mouthed, “I’m fast, handsome and I know it,” and then he started to walk away again. It was a very cool moment to be sure. 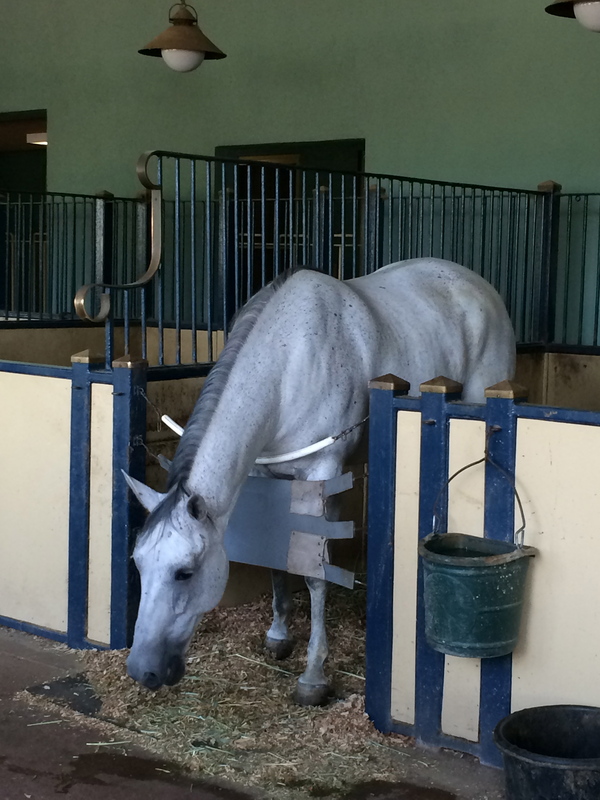 Even though it wasn’t furlong, it was fun to see this terrific looking animal. Our tour guide Paige said that’s the first time a tour group had ever gotten that close an encounter with American Pharoah, so we were quite fortunate. I had to saddle myself down for the rest of the tour. After disembarking the tram, the tour group (about 20 – 25 of us) was first led to the receiving area, where the horses are brought after the race. We learned some interesting facts, like how the horses are whistled to so they can urinate after the race (no specific songs, however) and that some horses’ tongues are tied with a piece of cloth so they can’t get their tongues under the bit while racing. If that happened, the jockeys have no control over the horse and can’t stop them, which is a dangerous predicament. Fortunately, they don’t bite their tongues when they pee (probably too busy whistling along). 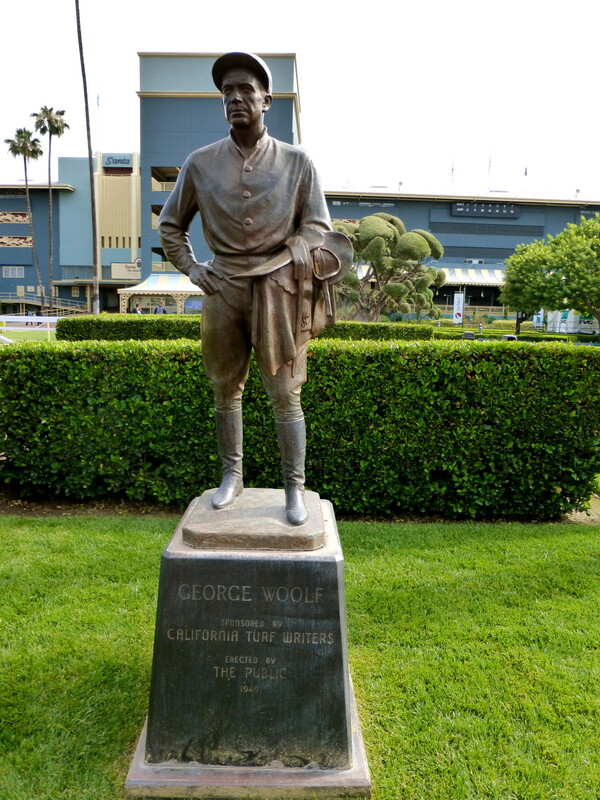 Our next stop was a statue of one of the most famous jockeys to ever ride at Santa Anita. 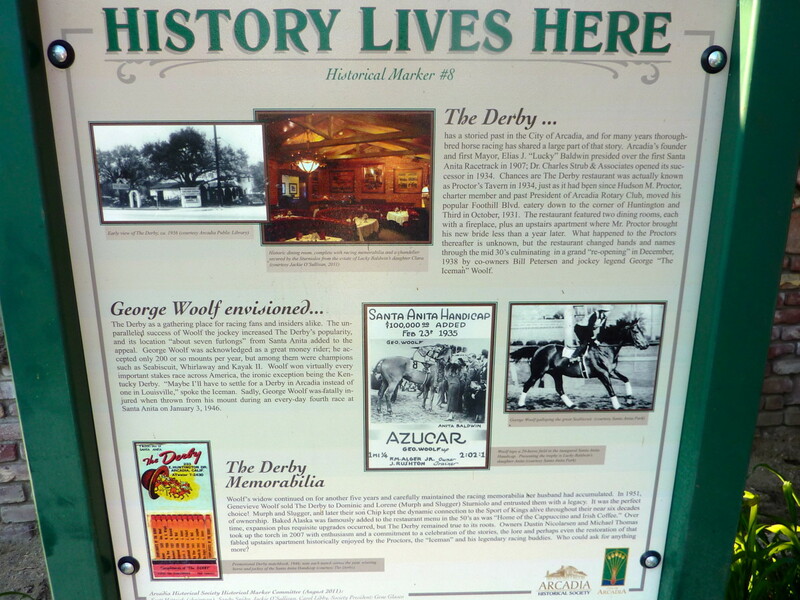 George Woolf was the jockey on Azucar, the horse that won the 1935 Santa Anita Derby (the first $100,000 horse race). 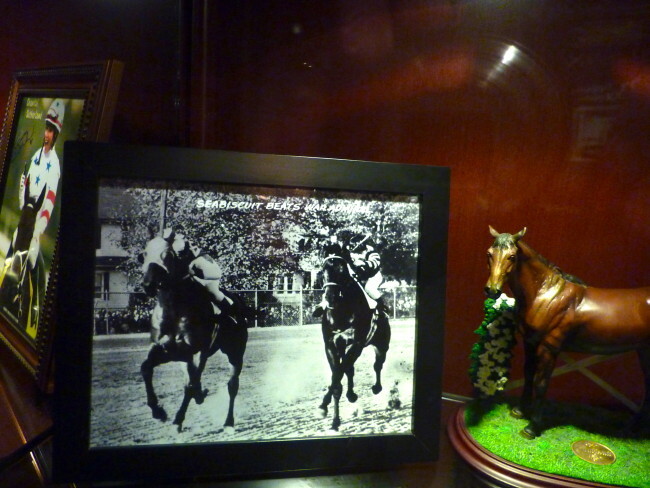 He also rode Seabiscuit in 1938 (jockey Gary Stevens played Woolf in the movie). 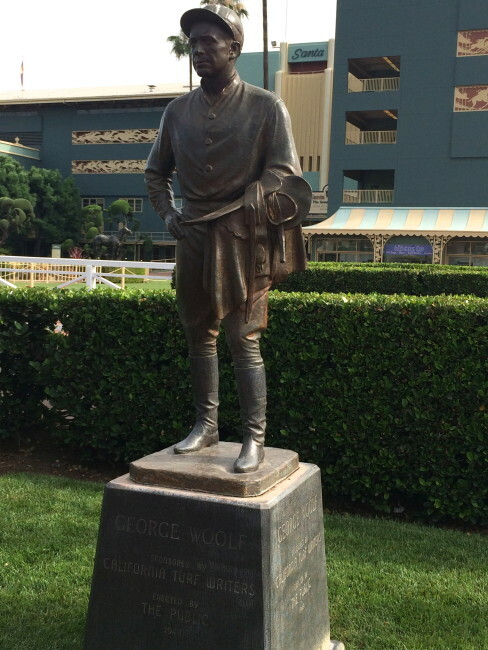 Known as “The Iceman,” Woolf, who was a diabetic, won 97 stakes races in his short career, despite the fact he couldn’t ride in a high number of races due to his disease. On January 3, 1946, the 35-year-old Woolf was riding a horse named Please Me in the 4th race at Santa Anita when he fell off his mount. His diabetic condition probably caused the fall, and since helmets in those days were virtually useless, he died the following day from the head injuries he sustained in the accident. Even sadder was the fact that Woolf planned to retire from racing later that year. 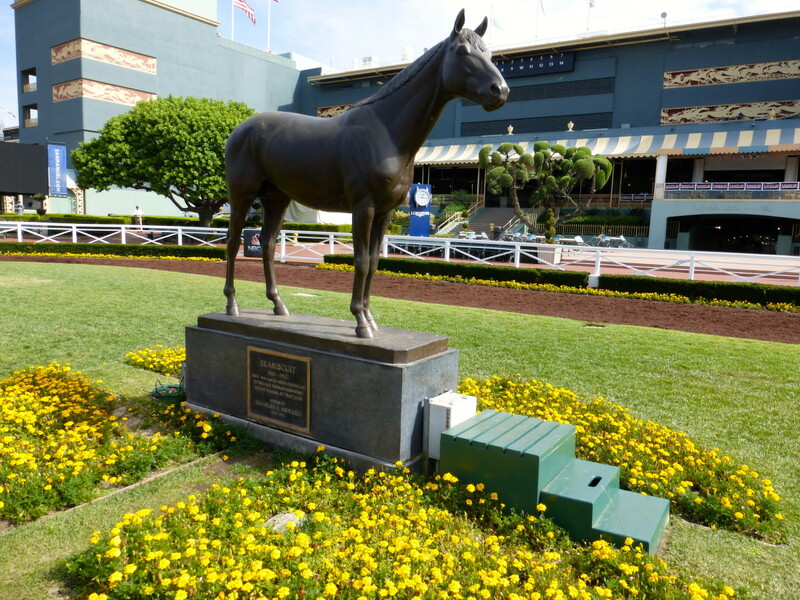 The statue is located near the Walking Ring at Santa Anita. It was erected in 1950, funded mostly by donations from his thousands of fans. 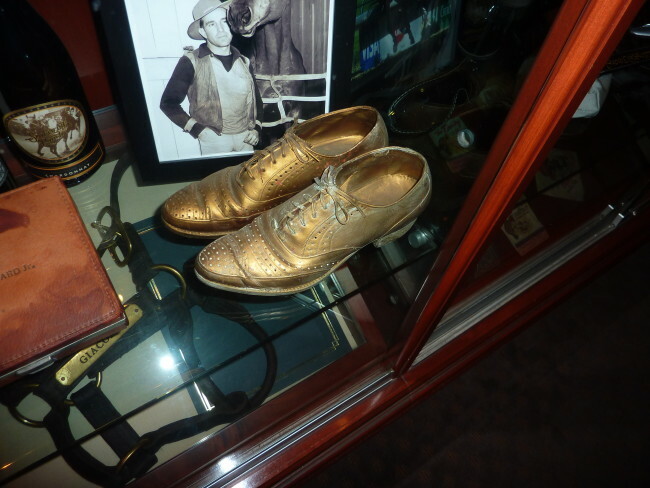 Woolf’s actual boots and saddle were used for the dimension of the statue, but our guide was unsure if it is an actual “life-sized” statue. If you look closely, you can see three rubber bands around his fingers. This was to keep the leather reins from slipping from his grasp. These days, we were told, reins have rubber on one side. Woolf was also owner of The Derby restaurant in Arcadia (see Tom’s Dining Out for details). There is paraphernalia from his riding career that you can see there. 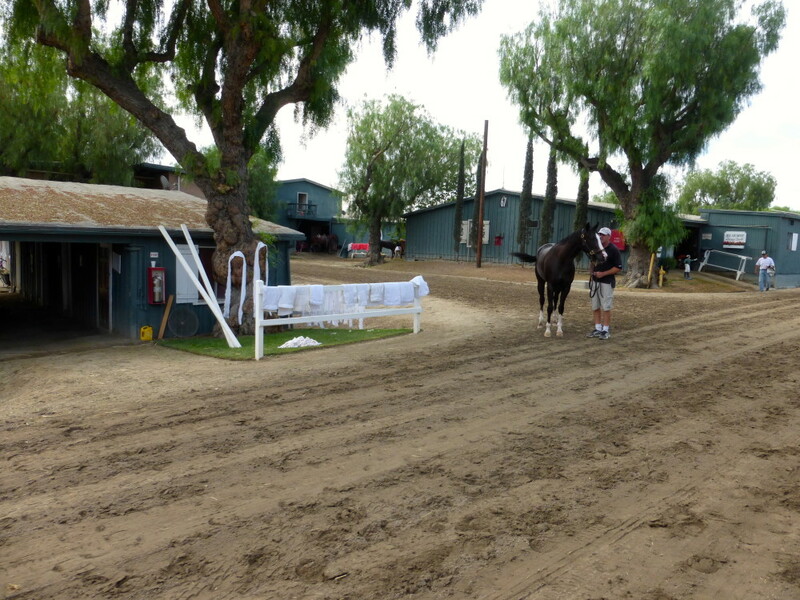 We walked a short distance to where the jockey’s “saddle up” before the race. It’s called (appropriately) The Saddling Paddock. 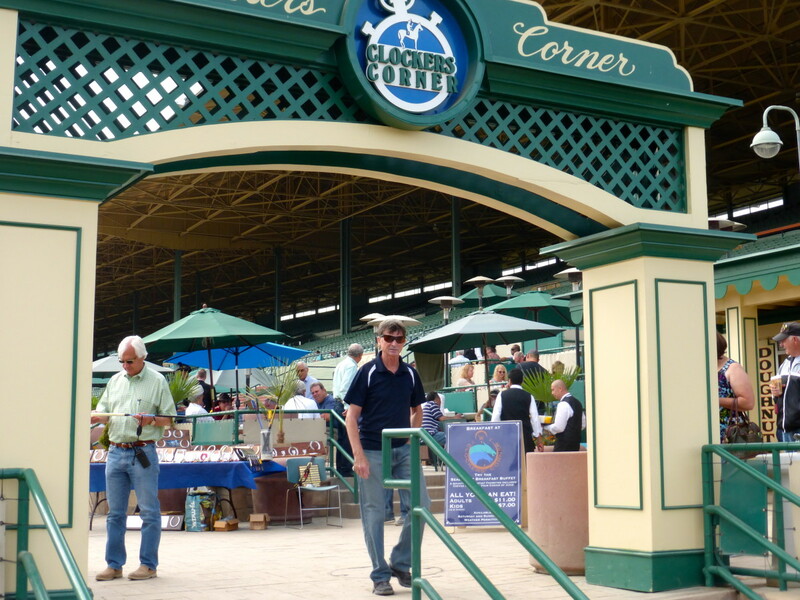 It’s a great place to go in between races (when there’s not a lot to do except down a few gin and tonics while betting) and check out the horses for the following race. Then it was time for some silk stalkings by our group. 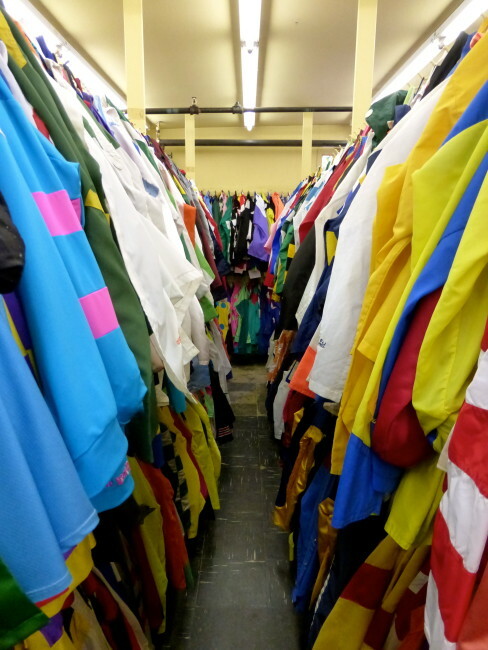 We entered a room full of colored silks (actually most are now made out of nylon or lycra) each jockey wears. In the next small room, an exercise area, there were a number of “fake horses.” Many of these were used in the movie Seabiscuit, because Toby Maguire was not really a jockey. 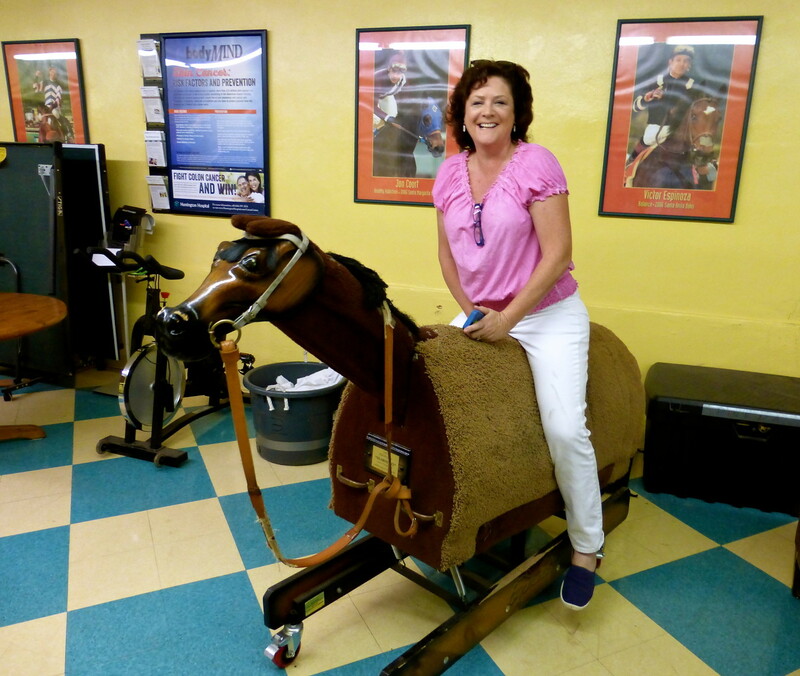 Tracy horsed around and climbed on one of them, auditioning for a part in Seabiscuit 2. 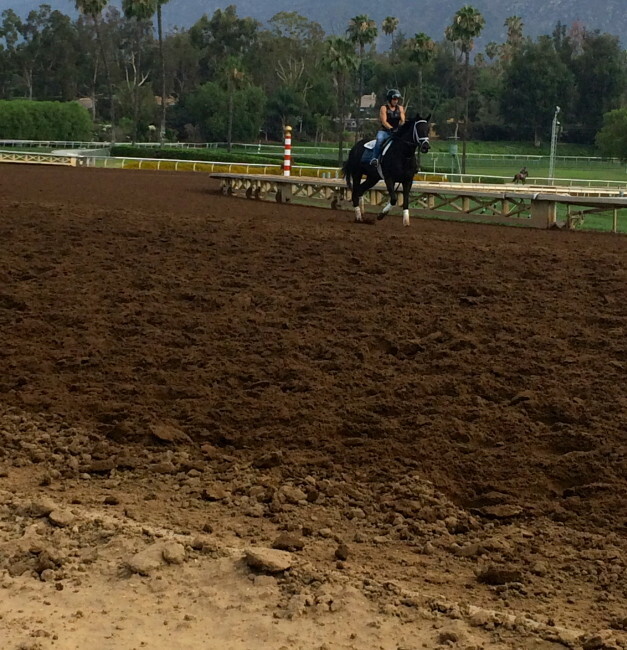 I told her she could stirrup a lot of trouble doing that kind of thing. She took my criticism with an air of equine-imity. Next we stopped in The Jockey’s Room. 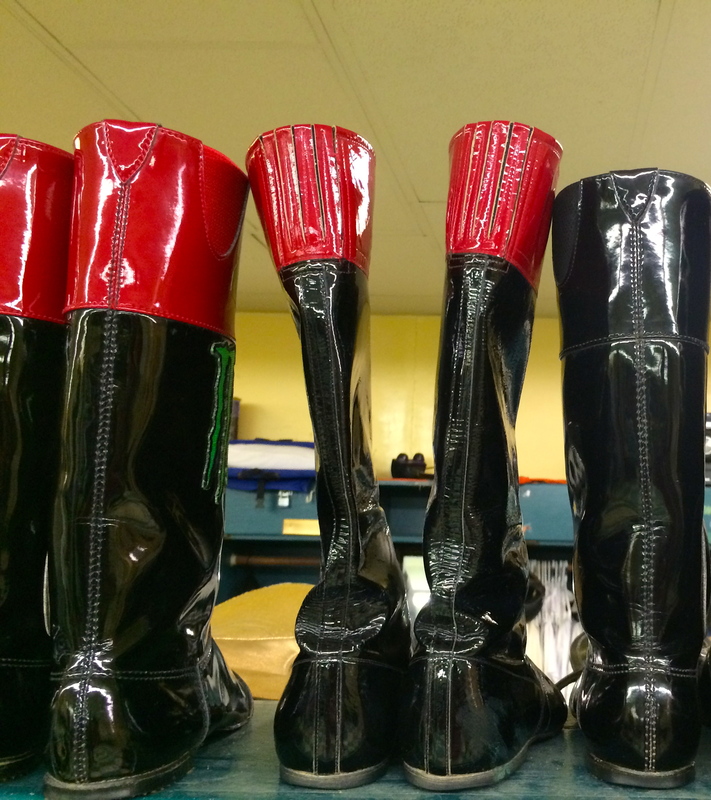 Unlike Nancy Sinatra’s, these boot were made for ridin’. 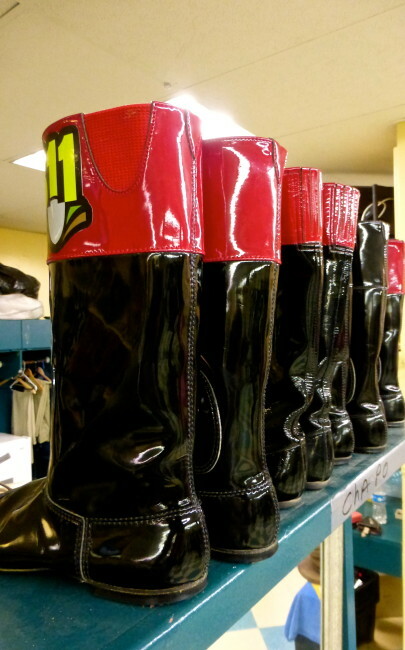 They even came in San Diego State colors. 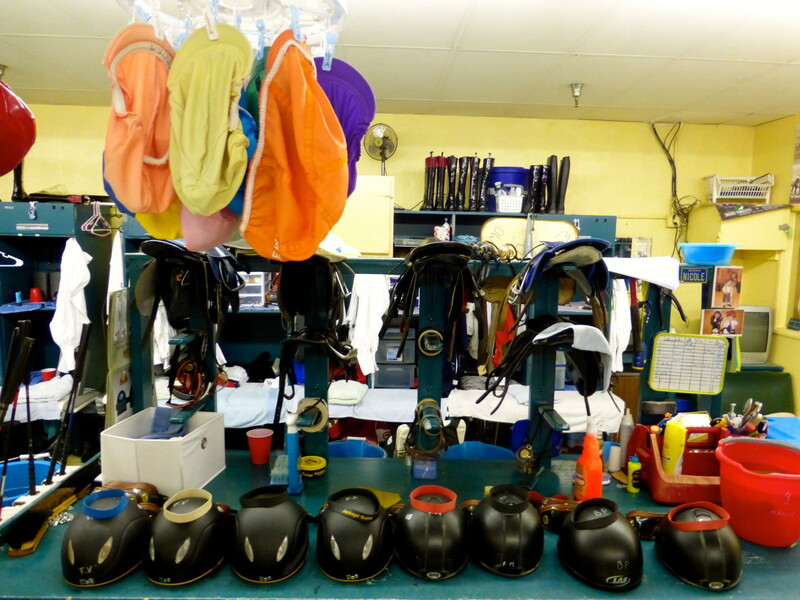 The various saddles come in different weights depending on how the horse is rated. 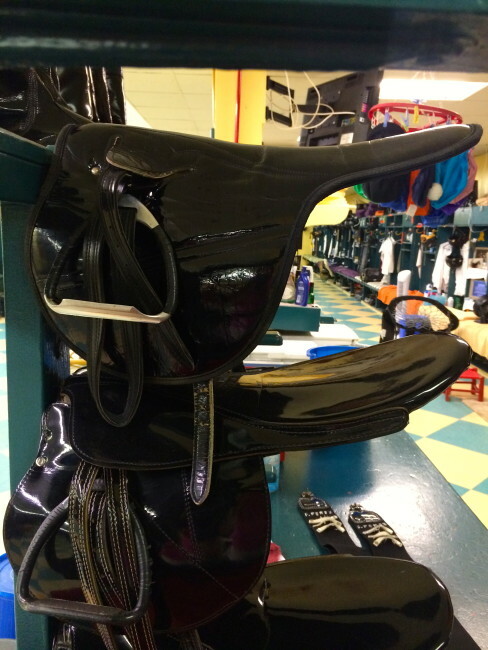 We had heard before from Paige that weights are added to some saddles to level out the playing field. 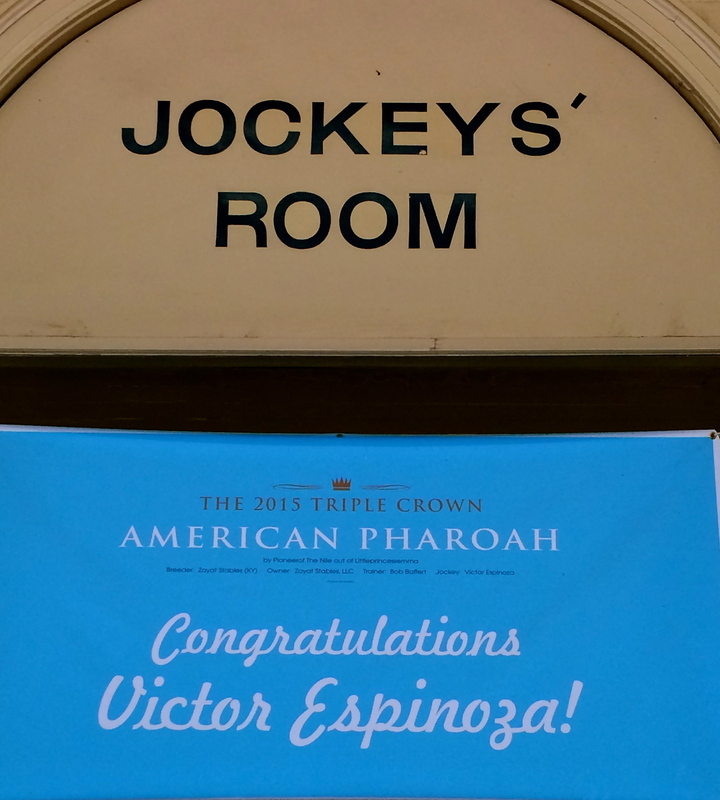 Walking out of The Jockey’s Room, we turned to see a congratulatory sign for Triple Crown winning jockey Victor Espinoza. 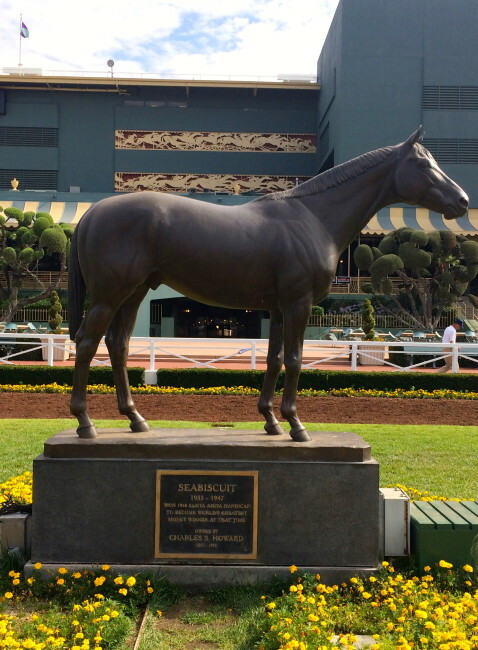 Now it was time to visit another icon of Santa Anita, Seabiscuit…well it was Seabiscuit’s statue. …is the bronze statue that honors Seabiscuit, the horse that captured so many hearts by winning the 1940 Santa Anita Derby. The life-sized statue has been on display since 1941. It was hand-tooled by Frank Buchler. Once again, it’s a story that ends with sadness, however. Seabiscuit died at the premature age of 14, suffering a heart attack. 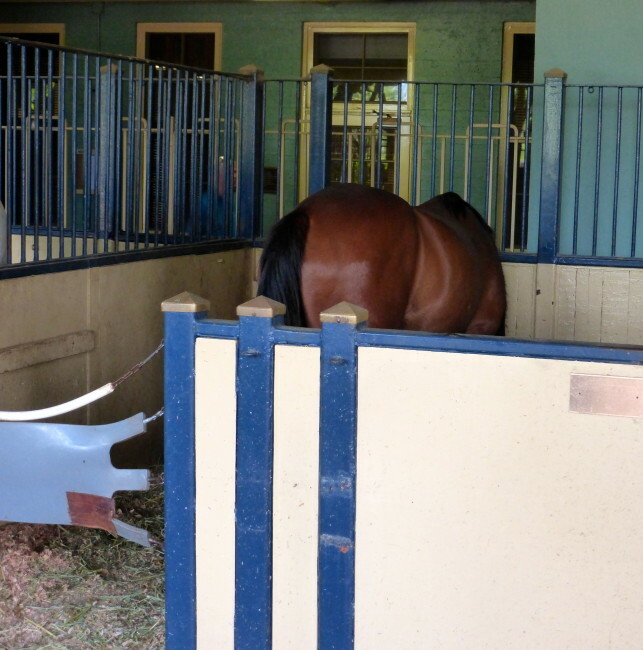 There is mystery involving the horse’s final resting spot. Paige said the owners were so distraught; they had Seabiscuit buried beneath a tree at their ranch in Willits, California. 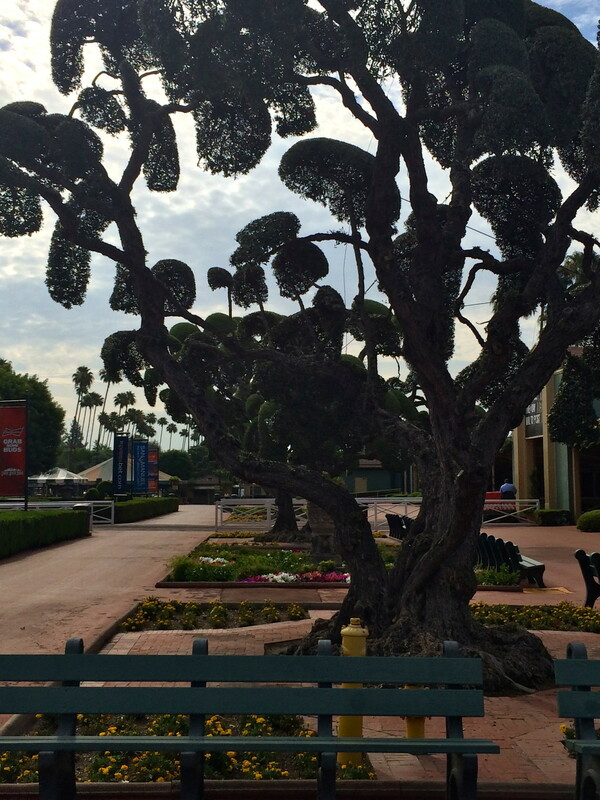 The location of that tree remains a family secret to this day. 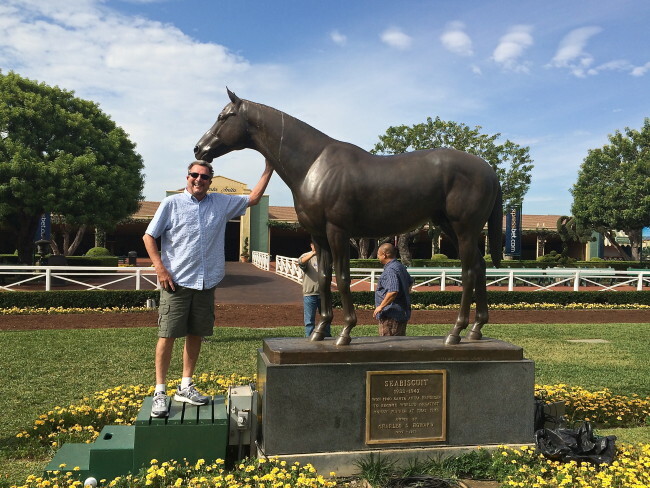 Meanwhile, I got a chance to meet the statue. 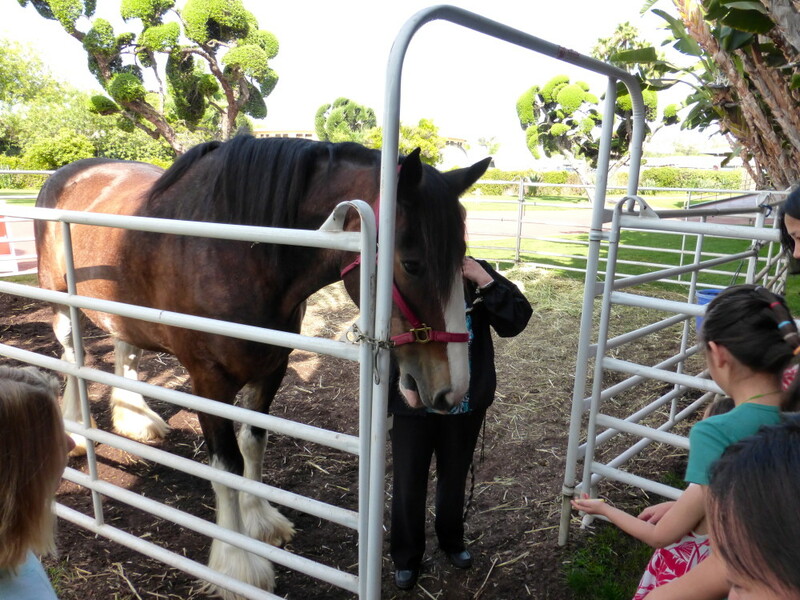 The tour was now in its stretch run, and we went over to meet one of the track carriage horses that our guide Paige owns. The kids on the tour were happy to get some horse petting at the end. 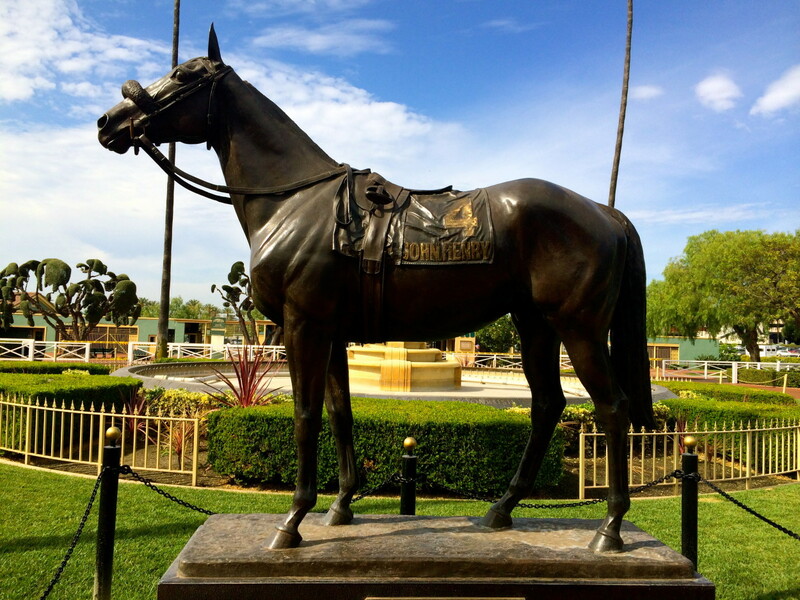 On the way we stopped by the statue of the legendary John Henry, who twice won the Eclipse Award for Horse Of The Year. 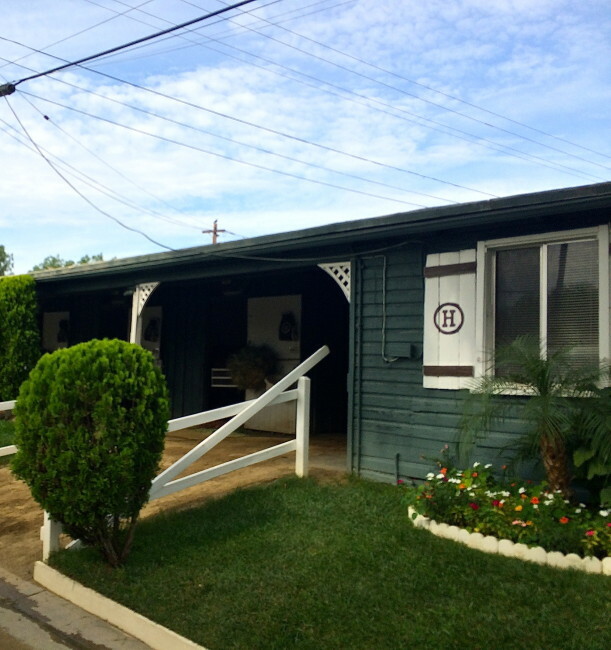 John Henry won back-to-back Santa Anita Handicaps in the early 80s. 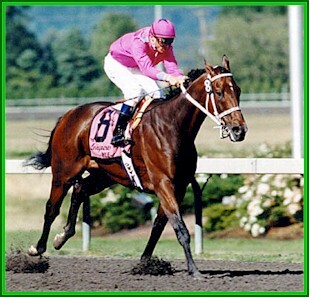 He was also the first racehorse to surpass $4 million in career earnings, and he is the all time leading Stakes Winner at Santa Anita and Oaktree with 12 career wins. Afterward, we looked up at a piece of art deco artwork that is on the side of the exterior of Santa Anita. 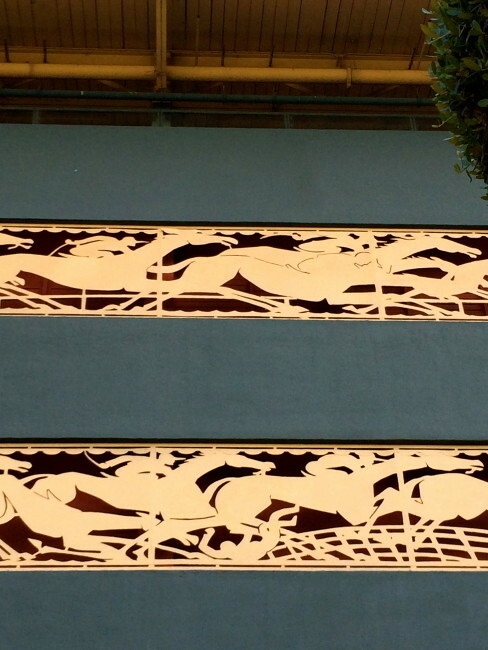 It is a mural of horses, and if you look closely one frame shows a fallen jockey. It is a remembrance to all the jockeys who have been injured or killed on tracks everywhere. On a much lighter note, we got to meet (well, we took his photo from about ten feet) the horse that played the primary roll of Seabiscuit in the film. Fighting Furrari was much too busy eating most of the time to acknowledge us, but Paige got him to pose for pictures for a minute. You know how these temperamental stars can be. 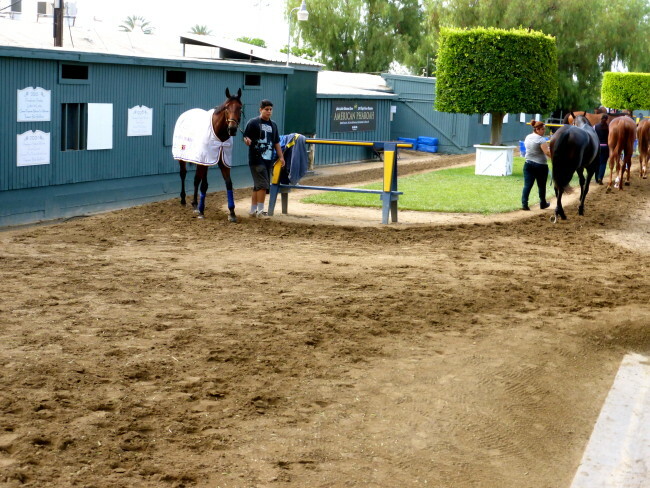 Much more amenable to having his photo taken was Paige’s horse, Hugs (he’s the one on the right by the way). 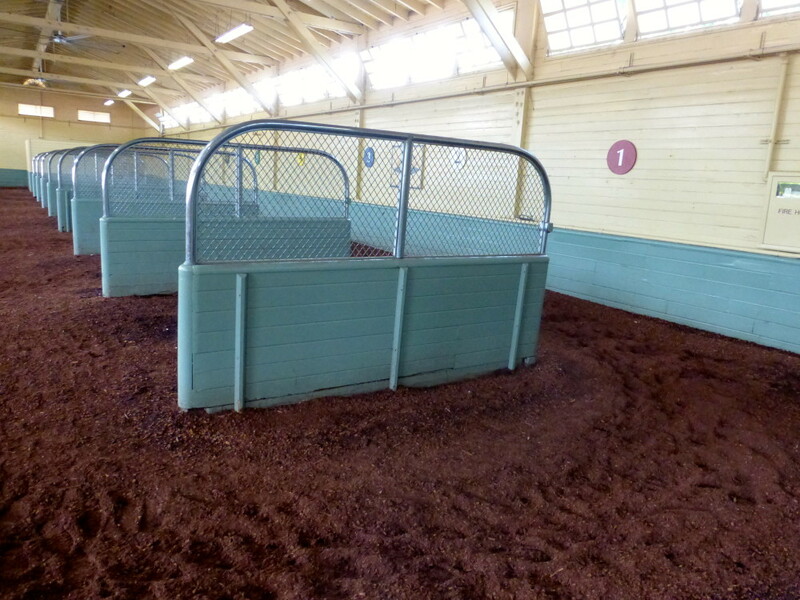 Hugs is also a track carriage horse. He mugged for the cameras the entire time we were there. I thought Tracy was going to steal him or at least give him a hug. That was then end of the tour…but not our day. I had important business to take care of at the betting window. 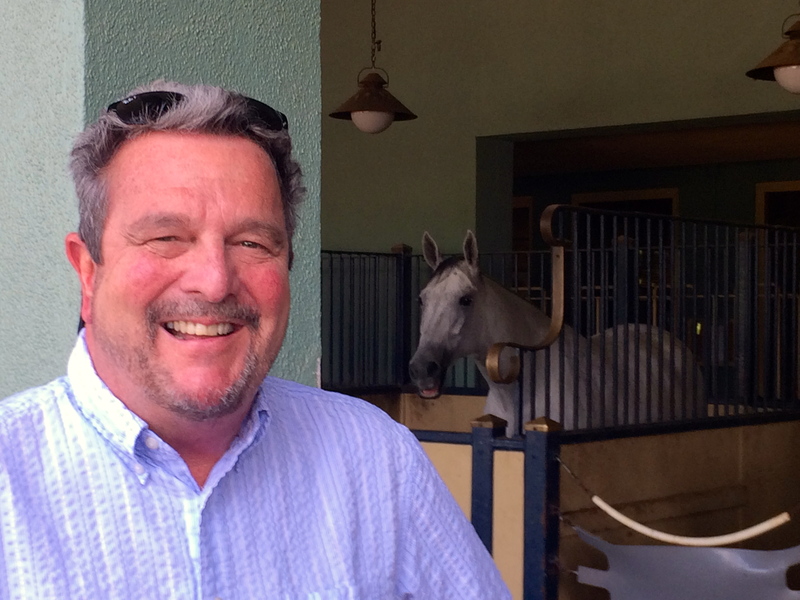 When I was at Santa Anita in March, I had bet on a horse named Singing Kitten (take my word for it, always bet on the “Cat” horses). 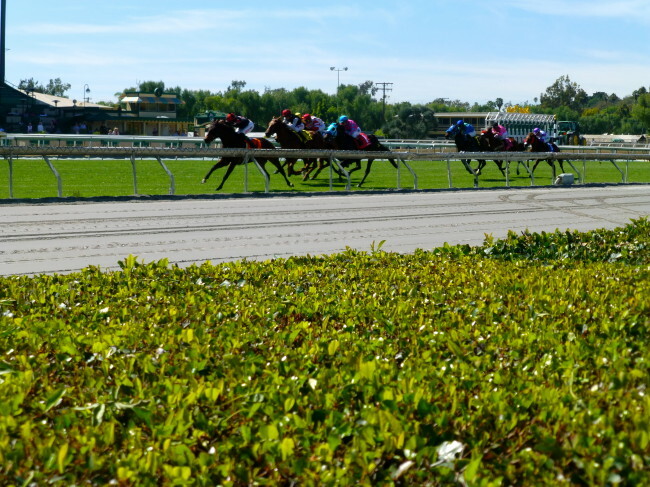 That afternoon, I had left before the 8th race, but when I went online, sure enough Singing Kitten had won and that winning ticket paid me a nifty $104 for my five-dollar bet. 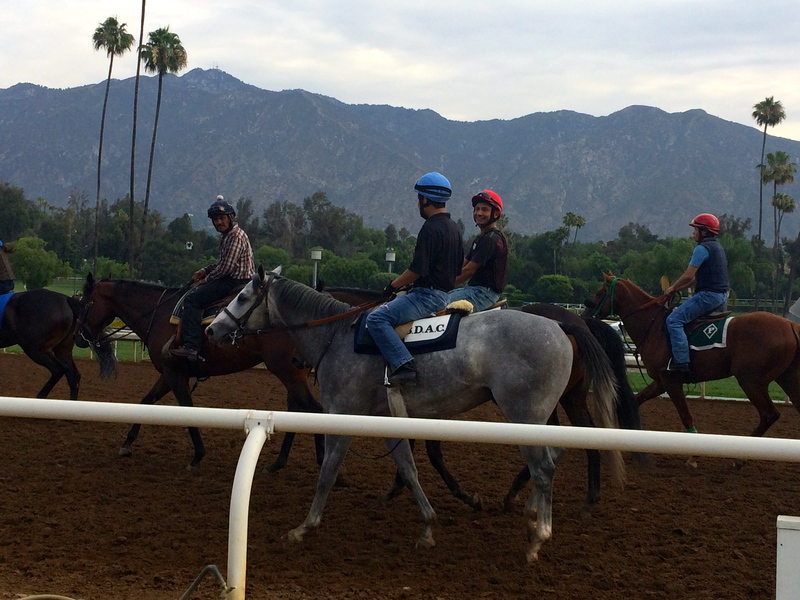 DIVERSION: Now back to why Santa Anita has paid me money over the years and why “Cat” horses are my favorite. 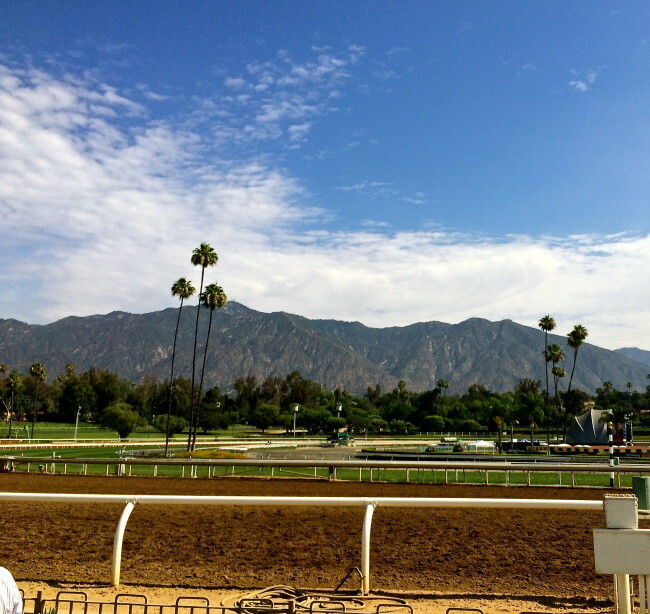 In 1999, I received a phone call on a Friday night from some friends who said they were going to Santa Anita to bet the Breeders Cup races (the actual races were being run at Gulfstream Park in Florida). 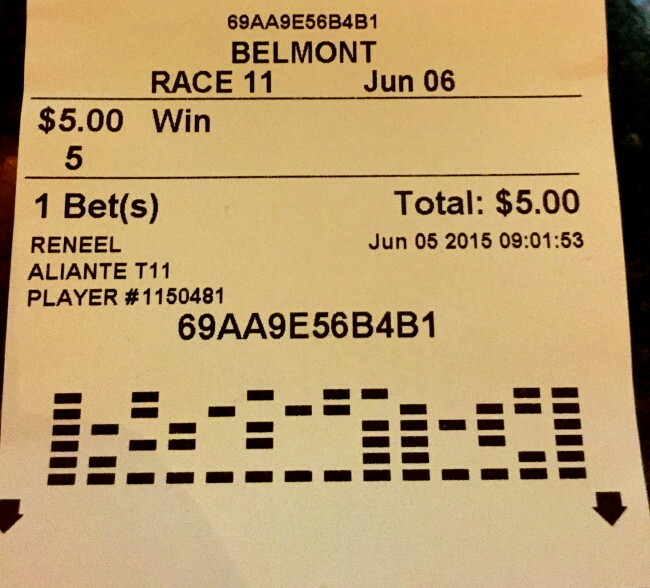 They asked if I wanted to bet. Well, the only two horses I really knew were Cat Thief, trained by D. Wayne Lukas, and a Southern California horse named Budroyale. They were running in the same race, the Breeders Cup Classic, and since I was on my second Friday night margarita, I bet a $5 exacta box and promptly forgot I had bet it. The following morning I drove to San Diego to play golf. When I got off the course, my cell phone had a dozen messages. I, of course, thought someone had died. 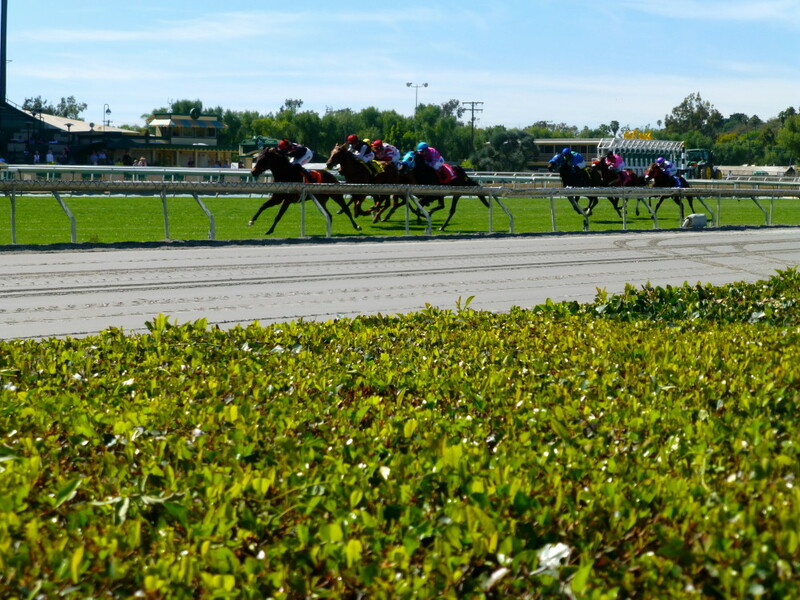 As it turned out, Cat Thief had won the race and Budroyale had placed second. 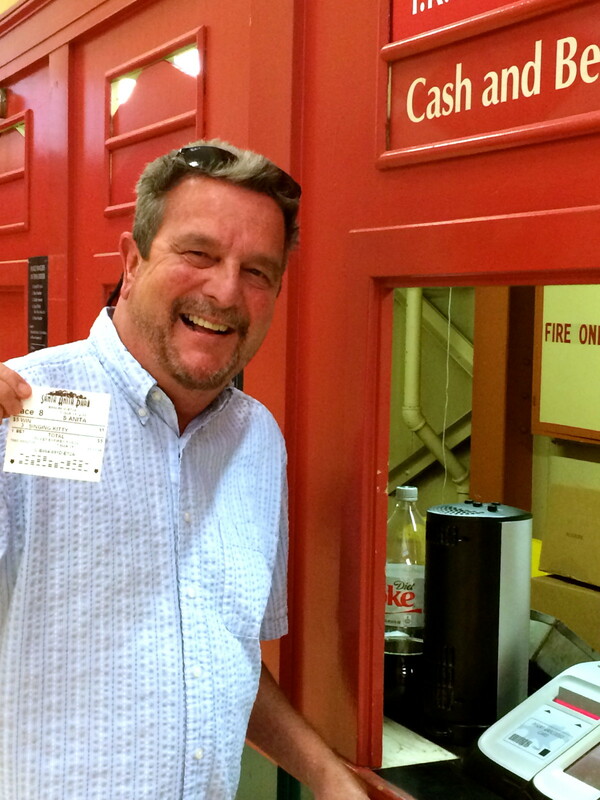 I was $3,300 richer. 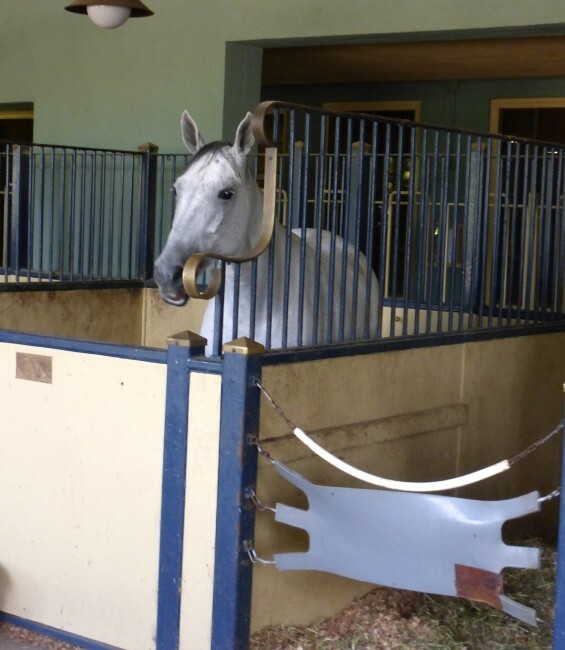 I love those two horses. 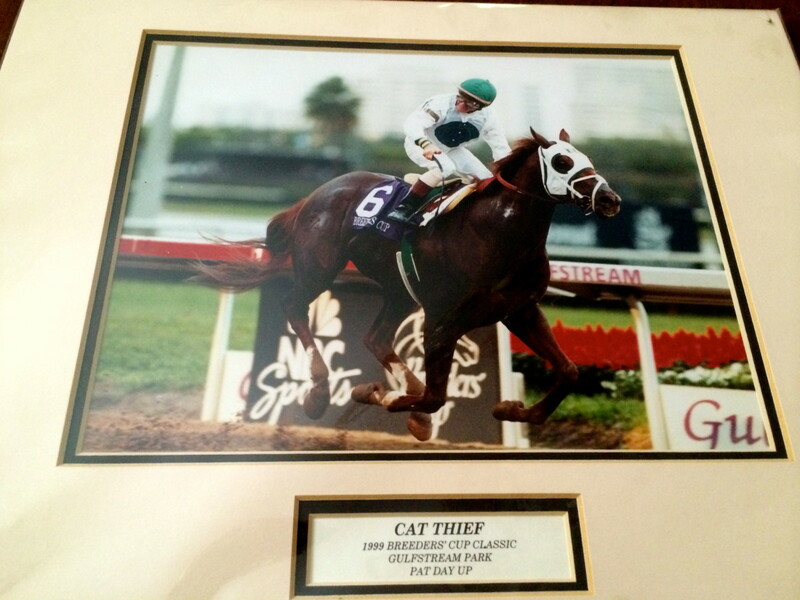 I even have a Cat Thief photo I bought for the sports room (don’t worry Bud, I didn’t forget you…thanks Internet). 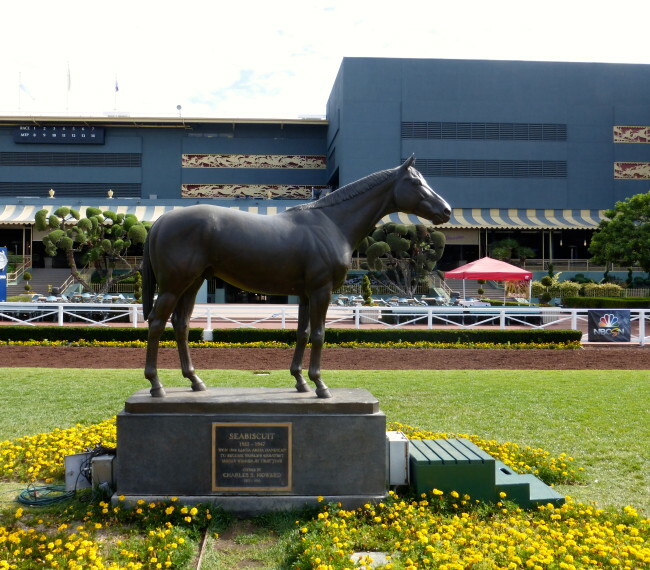 As good as that was, had you bet a $1 Superfecta and included Golden Missile and Chester House with those two horses, you would have won $692,907.00; the highest paying Superfecta in Breeder’s Cup history. A quick note…a few months later Budroyale returned the favor and edged out Cat Thief in the San Antonio Handicap at Santa Anita. The payoff was not quite as large. Anyway, this past Sunday after getting my money for Singing Kitten’s big win, there was only one piece of work left to do…eat. We galloped over to Clocker’s Corner for breakfast. 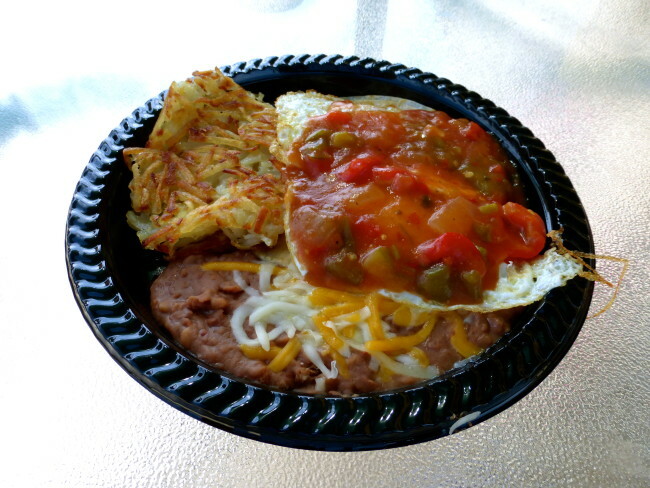 After eating our delicious breakfasts, we all now had a different meaning for “carrying extra weight.” As you can see, they have dog biscuits in case you want to bring your pooch. 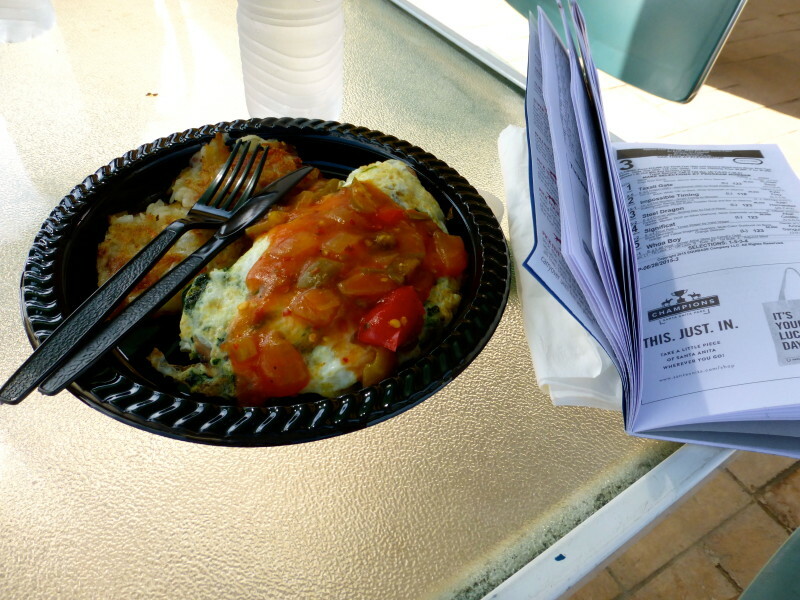 I had a delicious Huevos Rancheros, while Tracy opted for the Egg White/Spinach/Mushroom topped with Tomato and Bell Pepper Sauce. 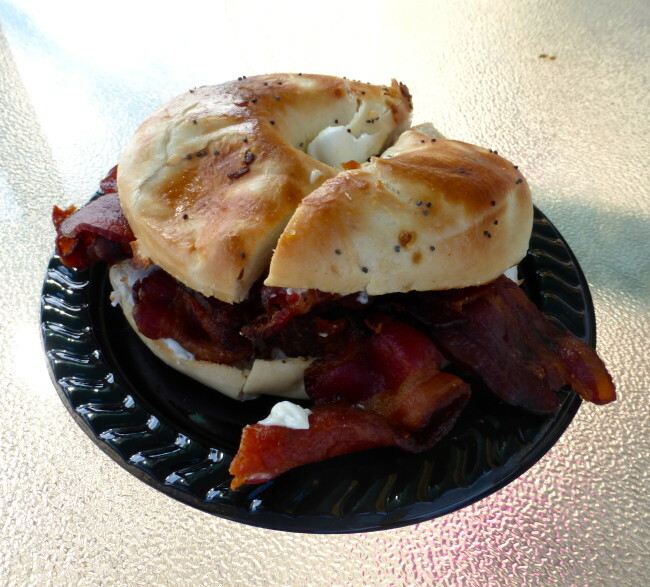 Susan tried the Bacon Bagel Sandwich. When the track reopens in December, we’re going to come down to Clocker’s Corner here early for breakfast to watch the horses work out. 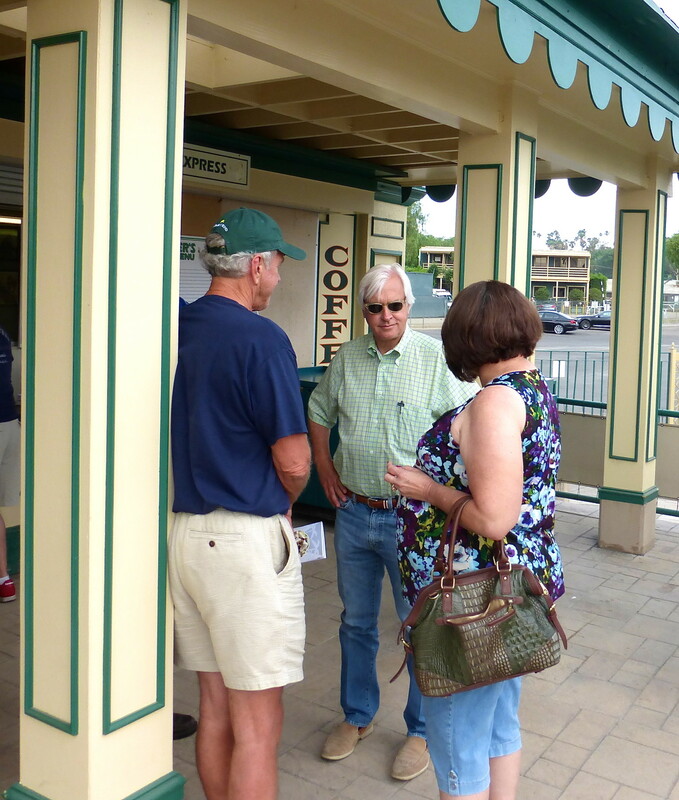 We really had a terrific time on the Seabiscuit Santa Anita Tour. 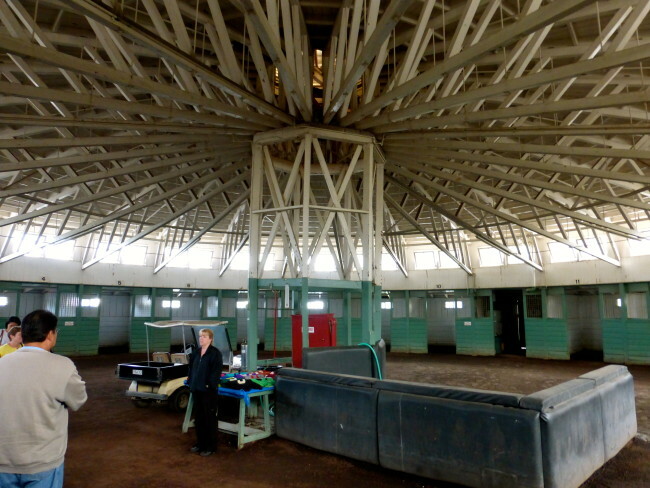 They’ll start back up in September when the horses run here again. 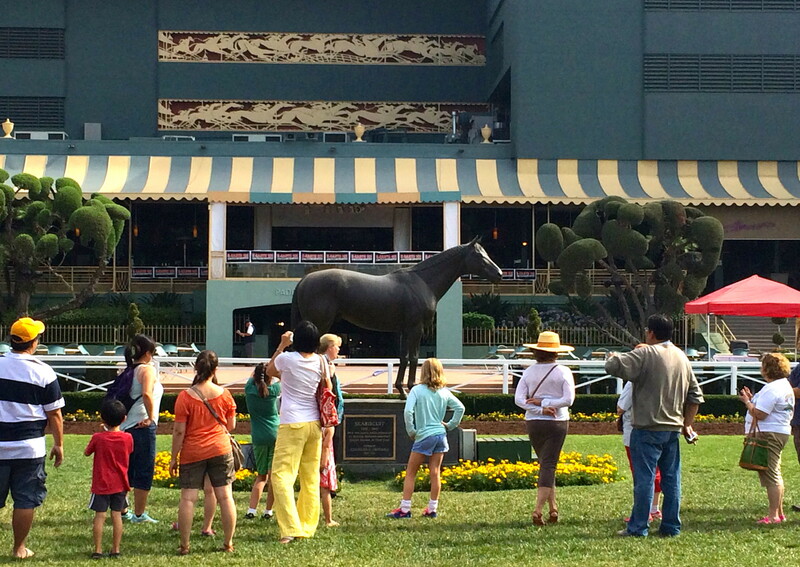 Tours start at 8:30 and 9:45 every Saturday and Sunday during the racing season, and advance reservations are a must. The tram tour lasts about ten minutes and the walking tour another 45 minutes or so. 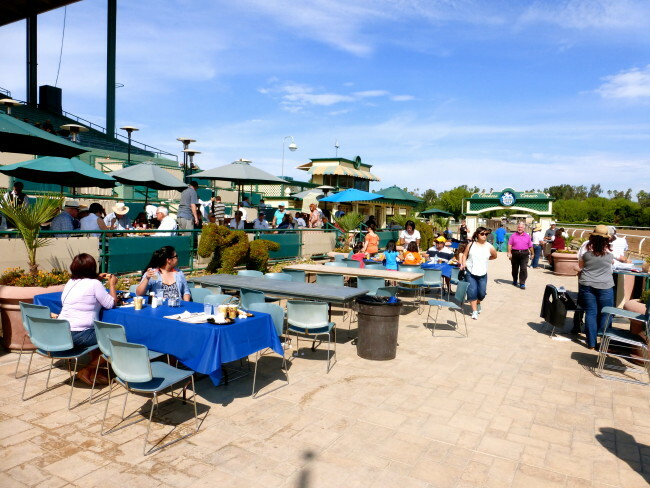 There’s no guaranteeing you’ll see an American icon like American Pharoah, but it’s a sure bet you’ll have a winning time at “The Great Race Place.” Check it out when the Autumn meet starts on September 26. And remember…bet the Cat horses! !